My October article for The Japan Times is all about pork in Japan, with a recipe for tonkatsu. Tonkatsu is arguably the best known pork dish from Japan, though there are plenty of others, since Japanese people eat almost as much pork as they do chicken and beef combined. I also delved a bit into the historical relationship between meat, especially pork, and the Japanese people. For instance, you'll see how Buddhism-influenced official edicts discouraging or even outright banning the eating of meat were circumvented by some - they just said meat was 'medicinal'! Anyway, I hope you check it out. I already have a (rather old) recipe for tonkatsu on this site, but I've given more detailed instructions and a different method for frying the tonkatsu (in two stages, at two different temperatures) for a crispier coating. As an aside, I'm really proud of the frying photos we took (The Guy took care of the lighting and so on, while I did the 'styling', which mainly involved keeping the breading looking as clean ss possible.) Looks great, don't you think? 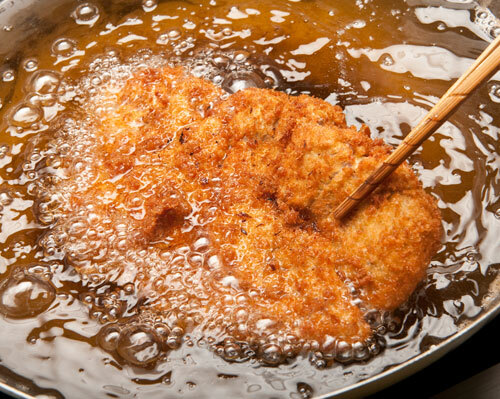 No you don't want to be eating deep fried foods all the time. But on occasion - why not? 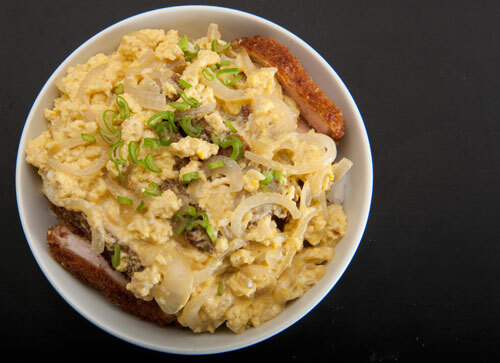 Katsudon, which means 'cutlet (rice) bowl', is a popular variation on tonkatsu. You could make it with leftover tonkatsu, though it's much better with a freshly made one of course. If you do make it with a leftover tonkatsu, reheat it in a dry frying pan, the oven or an toaster oven (not the microwave, where it will turn tough on the inside and soggy on the outside) until heated through ahd re-crisped. This cooks very fast, so make sure everything is ready to go before you start. Put the hot rice in a bowl. Arrange the tonkatsu slices on top. Put the onion and dashi in a small pan and bring up to a boil. Add the soy sauce and sake. Boil another minute. Add the eggs and start beating with chopsticks vigorously. Your aim to is to have very loose, soft scrambled eggs (though if you are not sure about the age or provenance of your eggs, cook them a bit longer). When the eggs are still loose, pour them over the rice and tonkatsu. Add garnish, and eat immediately while piping hot. You should have to blow into your bowl as you eat to cool it down. Submitted by maki on 2011-10-28 13:35. Crunch + Pork = YUM in any language. That's interesting that you use two temps for frying the pork cutlet. It is the same way that Michael Symon & Bobby Flay (the Iron Chefs) recommend making perfect fries in their books, 'Live to Cook' and 'Burgers, Fries and Shakes' respectively. However, they each give two different temp ranges, but it's for the same reason: first is a lower temp to remove moisture and a second, much higher temp, to crisp the fries. I suspect that we are going to find that a two-temp frying method works for things we never have tried before, like this pork cutlet! 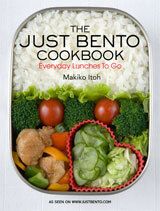 Since I already have your book (Japan print version), I will print this so I can add to bento box! Thank you Makiko-san!! This is my husband's favourite donburi! Thanks for posting this recipe. A question for you... How long will Sake keep once it has been opened? I live in a smaller town, and only HUGE bottles of sake are for sale here. I don't drink, so just wondering if it will keep for a while if refrigerated? Thx! You don't even have to refrigerate it...just keep it well closed in a dark place (like a kitchen cabinet) and it should be fine for a while. I have kept bottles around for a couple of years, though you probably should try to use it up after opening in a few months. The picture looks good enough to eat by itself! Thanks for posting this recipe. I have fond memories of having tonkatsu at a little place in Orio, part of Kitakyushu, Japan. The pork was freshly cut and pounded, and simply served with shredded cabbage. They gave each diner a small tsuribachi so you could grind your own sesame seeds, and then pour the tonkatsu sauce directly into the tsuribachi, which I do now at home -- I think it's a nice touch. Great recipe and very interesting article! Thank you for posting. Maybe this is the most delicious Katsudon I have tasted and i'm so glad that I have eaten this kind of food. Thanks for this blog, now I enjoy making this at home. First time ever I made katsudon, and it came out amazing! Thanks for another great recipe! Thank you for the katsudon recipe, Maki! I haven't tried it yet but last week, the husband and I had a huge craving for katsu curry, we ended up making chicken karaage curry and rice. So satisfying for a cold day here! I will try the katsu recipe soon. Please start feeling better, we're hoping for a speedy recovery for you. They just opened up a couple months ago, and it's a big hit. I've been twice now and am excited for my next visit. I followed your recipe with the exception of substituting chicken for pork (dietary restrictions). It turned out great. I was very surprised by how nice the eggs tasted after being scrambled in the dashi stock. My husband and young daughter both said they want to eat this again. Thanks. Just letting you know the first link to the Japan Times tonkatsu article is invalid (it goes to the homepage) but the second one is right and goes to the appropriate article.... just thought you might want to know. Tonkatsu + rice + kare sauce = a true slice of Japanese heaven!! Question: If you are going to use pasteurized eggs, how much (or rather how little) should they be cooked? Obviously, there's no need to get to the full-on scramble stage, but I suppose my question is really how thin should the sauce be, traditionally? It should just about set but still pretty runny, rather like the inside of a 3-minute egg (but all mixed up). Hi, love your blog. Just in follow up to mike's question on 12 March re katsu, rice and curry sauce, we have a restaurant in london called Tsuru that does an amazing chicken katsu with rice and curry sauce (they also do a scotch egg one which I am yet to try!). I have promised my wife I would recreate this and came staight to your website for inspiration. For the curry sauce would it work making your beef curry base but leaving out the beef?